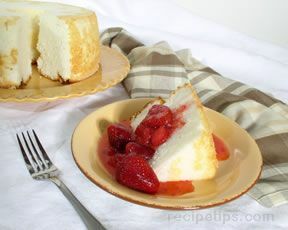 Everyone will enjoy this light angel food cake with its fluffy cream cheese frosting and decorated with strawberries and blueberries. 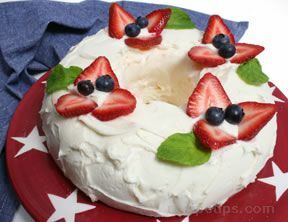 Decorated in red, white, and blue, this cake recipe is great for Memorial Day, 4th of July, or any special summer get-together. Bake cake according to package directions or purchase a ready made cake from your local bakery. 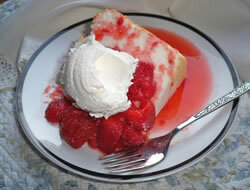 In a large bowl, beat cream cheese, sugar, salt, and vanilla until smooth. In a small bowl, whip the heavy cream until stiff peaks form. With a spatula, lightly coat the cake with a thin layer of frosting. This layer will act as a glue to keep all of the crumbs together and on the cake. Place cake in freezer for approximately 15 minutes, or until the first layer of frosting sets. Generously apply the second layer of frosting. This will be the decorative layer. The crumbs will not show through since they have been set into the first layer. Wipe with a damp paper towel and remove the stems of four ripe strawberries. Cut the strawberries into thin slices. Approximately four slices per strawberry. Arrange three to four slices into a flower or star pattern on the top of the frosted cake. Place two to three washed and dried blueberries into the center of the strawberry stars. The fruit can be arranged in different ways and still achieve a patriotic effect.